NOTE: For the best viewing experience Click on the image or gallery to view in LightBox Mode. As I stood at the edge of the shoulder high, stone wall, I saw the gates swing open at the far end of the giant oval known as the alminninger, and a mass of woolly sheep, fat from feasting on highland grass, sprinted towards the center of the ring. Some leaped, and many were baying and bah-ing, wailing even, but on they came spreading out like flood waters to fill in the open spaces inside the circle of stone. The crowds standing atop the ring observed with delight and cheered them on. In a matter of minutes the ring of stone was standing room only, completely full of sheep, all vying for any space they could find. It was 11:00 am on the dot and the réttir had begun. The first group of sheep rush into the sorting ring as the réttir begins. Sometime after my first trip to Iceland in the summer of 2017, I developed a keen interest in a cultural event that occurs regionally around the country in September, known as réttir. As our group circumnavigated around the country, I noticed ringed pens that looked like wheels with spokes, and after an inquiry about their use, was told they were sorting pens to separate sheep after the fall roundup (referred to locally as the gathering). Of course sheep in Iceland are prevalent. In fact we saw them everywhere from open pastures, up in the highlands, on hillsides above waterfalls, to grazing free along the ring road. To put this in perspective there are approximately 350,000 Icelanders and well over 800,000 sheep - about 2.25 sheep to human ration. 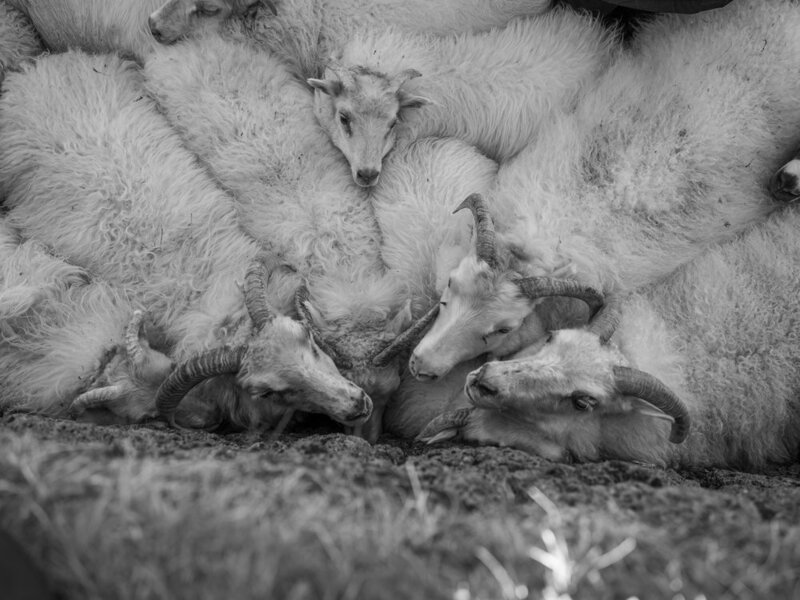 I started photographing the sheep as we drove around the island and I was completely struck by their thick woolly coats, short fluke-like tail, and faces and legs devoid of wool. Several of my fellow travelers on that first visit are knitters and at every stop for gas or food, they could be found buying Icelandic wool to bring home. All of them remarked about the superb quality of the yarn. A highland fed sheep displaying the characteristic long wool coat called a tog. Icelandic sheep’s wool is dual-coated and consists of the long outer coat, called tog, and an inner coat called thel. When the wool is separated after shearing it is used for different types of wool products. Sheep coloration and patterns range from white, to brown, and black. The actual base color of an Icelandic sheep is black or brown, and the overall color of the sheep, or pattern, comes from three specific genes, and each of these has a dominant or recessive factor. The Icelandic breed is a descendant of the Northern European short-tailed sheep and were brought to Iceland by the first settlers in the 9th century. Hardy and robust, they have been bred for over a thousand years in the harsh Icelandic environment, and are considered one of the purest breeds of sheep in the world. 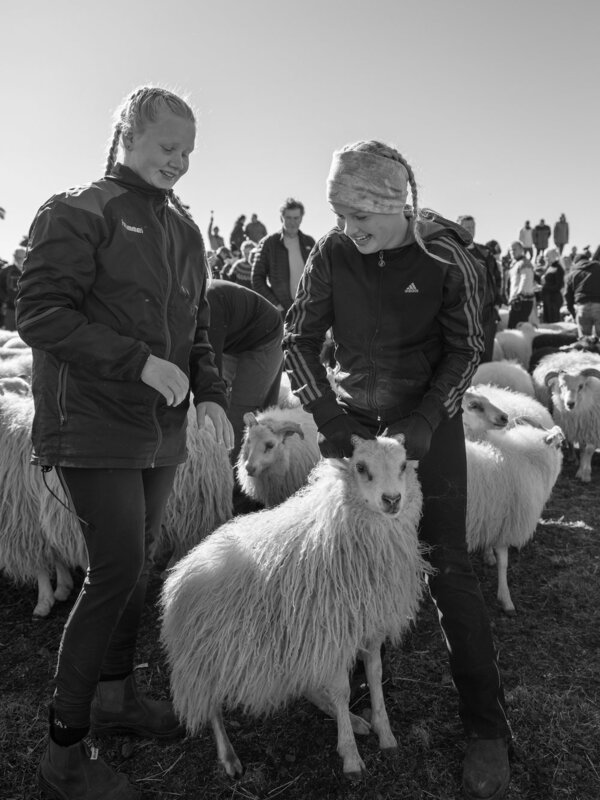 Prior to my recent 2018 Fall trip to Iceland, I contacted two native Icelanders, Pálína Axelsdóttir Njarðvik, and Hjördis Ólafsdóttir, both from farming families who have sheep, and was able to arrange for the opportunity to see the réttir up close and in person. I had a variety of questions about the logistics and timing, all of which became apparent, as the event unfolded. Hjördis was on one of the highland gathering teams and gave me an up to the minute schedule, of where they were as they brought the sheep towards Árnes. And as the réttir began in earnest, my travel partner, Adam Holston, and I just jumped into the swirling mass of sheep, keen to observe, photograph, and just be a part of it. After lambing season in May, and closer to the end of June, sheep that do not remain on the local farms are released to a common afréttur owned by the local municipality. Afréttur, in English, translates to uplands, but essentially denotes an area of common grazing lands. In the area I visited there are approximately 30 farms that share the same afréttur. All of Iceland is divided this way so there are many réttir sites and many afréttur areas. During the summer months the sheep run free and feed off of the nutrient rich grasses and heathers in their range. Visitors to Iceland in the summer months can see them roaming from the highlands to coast, and everywhere inbetween. Everywhere that is except on the glaciers. While on the summer grazing lands the sheep often spend their time alone, or maybe with one or two other sheep, but generally do not stay together as a herd. Mothers and their lambs do stay together, however while they roam free. And they intermingle with the sheep from other farms which is one of the reasons they must be gathered and sorted in the Fall. A young lamb, about 4 months old, with a very furry top coat. At the end of the summer all of the sheep must be gathered from the afréttur and returned to the local farms. This round up occurs all over Iceland during the month of September. The farmers select a “king”, or “queen” of the mountains, who leads the round up, and each farm sends one or more fjallmaður (mountainman), to the highlands to gather the sheep and bring them home. The number of fjallmaður who go depends on the number of sheep the farmers have in the highlands. 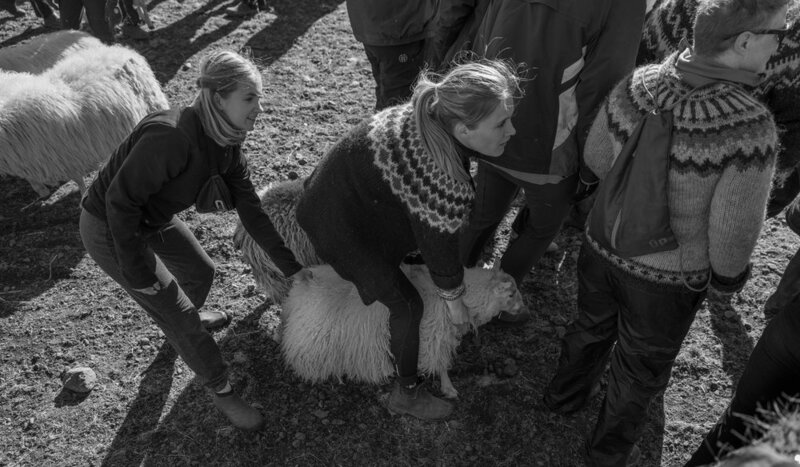 This group is generally broken down into teams who scour the sectors of the afréttur, riding Icelandic horses, and using sheep dogs, looking for the sheep. Gathering the sheep from the highlands is as old as the settling of Iceland and it has been done this way for centuries. 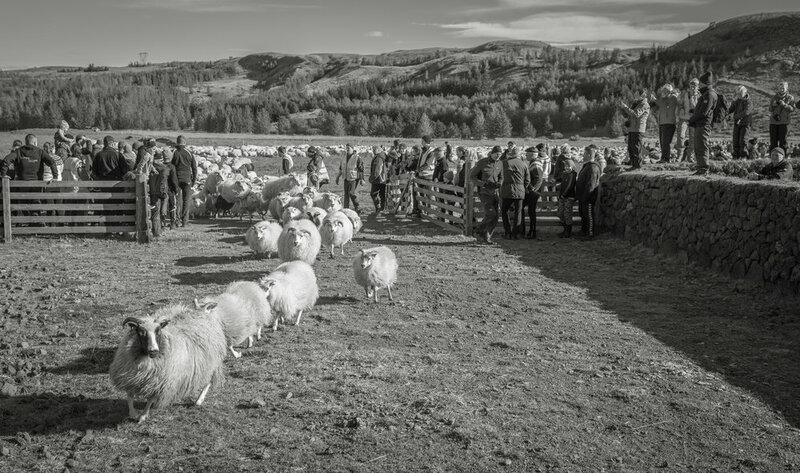 It is a tradition born of necessity but in my mind is an expression of common purpose and a distinct bond between the farmers, the sheep, and the very landscape where they live. Though Icelandic sheep are hardy through breeding and life in a harsh environment, if they do not come home, they will almost certainly not survive the harsh winter. There have been instances however, when sheep who did not “come home” have survived the winter. They are a tough breed and can go weeks without eating and can use their hoofs to scrape through the snow to find the grass underneath. But this is certainly not the desired outcome, and for the farmers, it is an economic imperative to bring the sheep home and they all work together to do this. It can take upwards of two weeks to gather the sheep in the highlands and during this time teams stay in mountain huts while searching. The longest gathering in the country is the one Adam and I attended for the Skaftholtsréttir near Árnes, and which takes 9 days to complete. 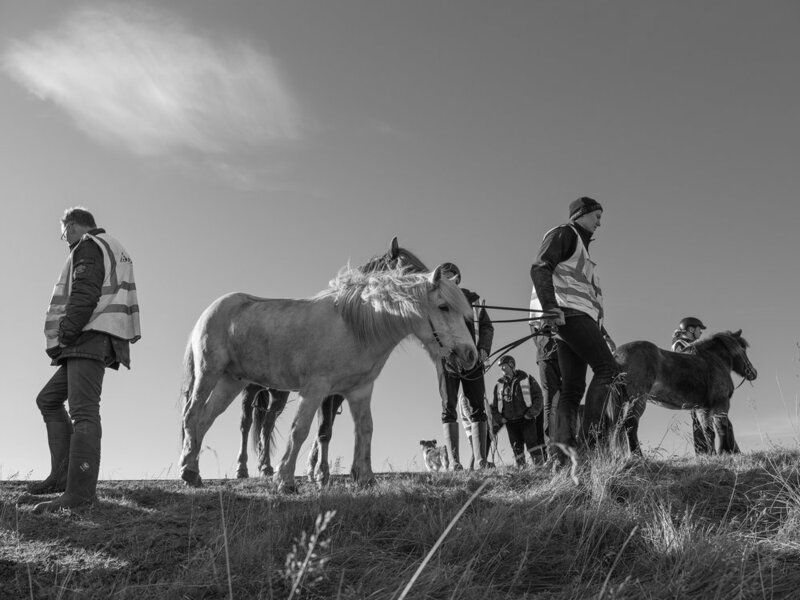 Multiple horses and riders are involved and all the food and gear is transported to the highlands with support vehicles or tractors. It is an incredible orchestration of events and because they have been doing this for so long is timed to perfection. Pálína’s uncle Ólafur has participated in over 100 gatherings, two times each year, in addition to helping with other gatherings, which given the difficult nature of the work is simply incredible. 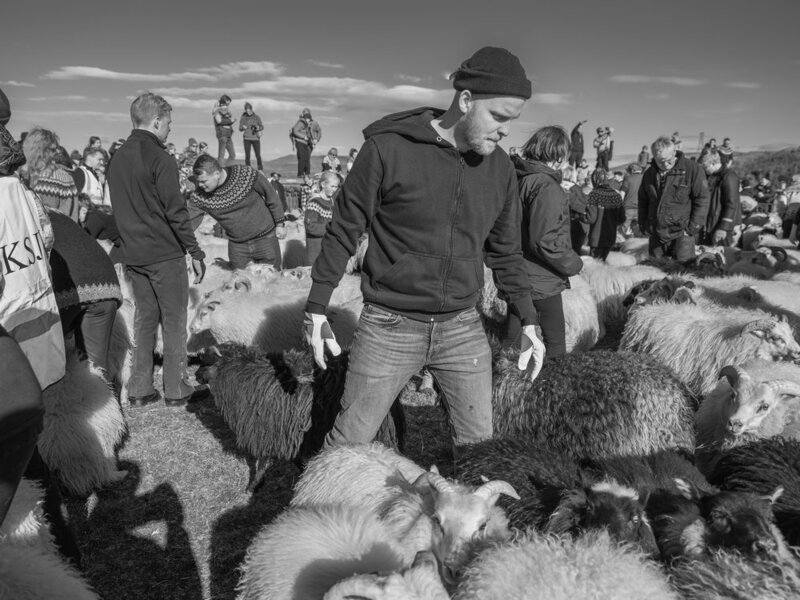 The réttir in Árnes is always in the 22nd week of the Iceland summer, on a Friday, and the herd arrives on Thursday evening, having traversed over many kilometers, and many days, from the highlands and down Road 32. The tail end of the herd moving down Road 32. The rear vanguard includes mounted riders and an Icelandic Sheep Dog. The gallery below includes images made the day before the réttir, as the herd of sheep moved out of the highlands, near Haifoss waterfall, and down Road 32 towards Árnes. 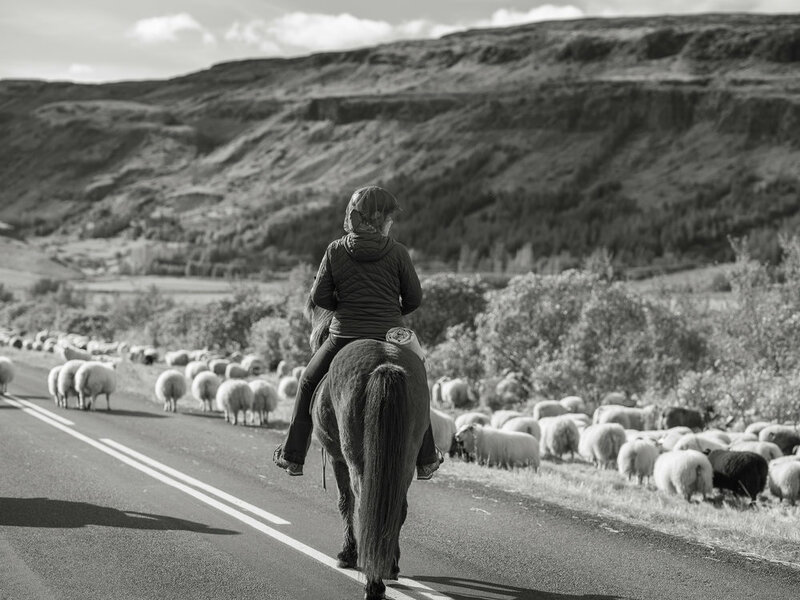 The “sheep jam” does bring automobile traffic to a complete halt and riders often work to block the flow of cars up and down the road to protect the sheep. Depending on which way you are coming and the number of sheep, it is possible to be caught for several hours along the road. Being at the back end of the group we were caught for about an hour but it gave me an opportunity to get out of the car and walk along, as the herd moved South. Mounted riders and sheep dogs kept the sheep moving, and occasionally they had to rustle the sheep out of the brushy areas along the side of the road. There is not an English translation for the word réttir. In means both the place where the sheep are sorted, and the event itself. The réttir site can best be described as a giant wheel with an outer ring, and an inner ring, called almenningur. Fences connect the two rings to create paddocks, or pens, called dilkur. At the réttir location in Árnes, the two main rings are stacked volcanic stone with grass tops, and with grass sides on the outer ring. Like many réttir sites in Iceland, the ring is old. I asked Pálína how old, and she said “at least as long as her family has been farming”, and that is seven generations! In the year 2000, the ring had to be rebuilt due to an earthquake. Her mom said that the site has been used for réttir since 1200 and is the oldest sorting site in Iceland. The réttir site showing the two rings and fences for sorting the sheep. The evening before the réttir, and even on the morning of the event, all the sheep are placed in a pasture adjacent to the ring. Riders on horseback, sheep dogs, and farmers on foot herd the sheep into the pasture and it is a great relief, and a culmination of long days in the saddle, when the gate is closed and that work is done. But in reality it is only one part of the process, albeit the hardest, and the real fun of sorting is just beginning. The riders unsaddle their horses and take a small break before the sorting begins. Almost to the end as the last group of sheep are herded into the holding pasture adjacent to the réttir site. Riders on horseback and foot herd the last of the sheep into the pasture. Saddle and saddle bags used on the long days in the highlands. Icelandic horses take a much deserved break after all of their work over the last 9 days. Around 9:30 to 10:00 friends and family begin arriving to the réttir to help, to watch, and to just immerse themselves in the event. It is a festive event and a celebration of the work done to bring the sheep home. 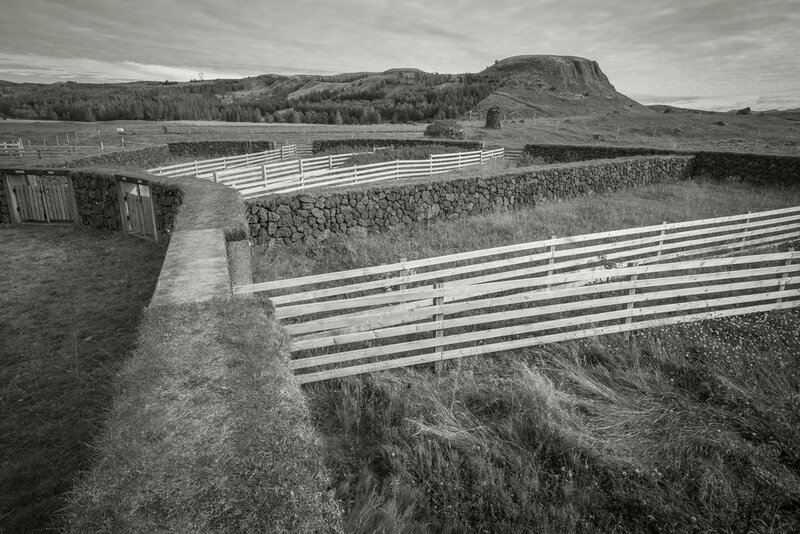 At precisely 11:00 the gates to the pasture and the almenningur are connected and a group of farmers, on foot, begin to herd the sheep into the inner ring. They literally form a human wall, clapping, whistling, pushing, and otherwise cajoling the sheep forward into the sorting ring. As the gates open the sheep at the front of the group rush into the almenningur. The framers at the back of the group pushing the sheep forward into the ring. Inside the inner ring, a pulsing, baying, bah-ing, and wailing river of sheep await the sorting process. Once the gates have closed the real fun begins as the farmers, and their helpers jump into the ring to find their sheep and sort them into their respective dilkur, or pen. Each farm has an assigned dilkur. Identifying the sheep is done by reading their ear tags, or through “marks” in their ears, which are farm specific patterns cut when they were lambs. Many of the farmers can simply identify their sheep by looking at their faces. Pálína’s uncle, Eiríkur is very fjárglöggur (knows his sheep easily), and can find all of his sheep this way. No matter the method everyone from adults to kids, family and friends, jump in to help with the sort. One of the farmers checks an ear tag, and ear marks during the sort. Dad, and daughter, checking the ear tags during the sorting process. It is like looking for a needle in a haystack as 1500 sheep move around the inner ring. The sorting process just begins. Once a sheep is identified it has to be moved to the dilkur. The technique is to grab it by the horns, straddle over its back, lift slightly, and walk it to the paddock gate along the inner wall. The farmers essentially guide the sheep to the gate and it is important to understand that no sheep are hurt in this process. It can be rather difficult early in the sort but as more and more sheep are placed in the pens it gets a little easier. And as one might expect the sheep are not always compliant, attempting to get away or buck as they are grabbed. Pálína’s uncle, Eiríkur, executing perfect sorting technique honed from many years of practice. This sheep is not too happy with the sorting. Pálína moving one of her sheep to the gate. Putting sorted sheep through the gate into the pens. Sometimes it is not so simple to get the sheep into the farmers pen. This process is kind of like controlled chaos. At first it seemed to have no order to it but as I watched the simplicity was revealed. Those in the ring were finding the sheep, and those at the gate were putting them into the pens. And all of this while the loose sheep rolled in and out of the sorters like a fast moving river. Empty spots in the ring would soon be filled with sheep as they tried to get way. Above, on the edge of the ring, onlookers enjoyed the game as it unfolded. Watching the sort and having a good time. In about two hours, it was over. Nearly 3000 sheep sorted in the farmers pens. With this work done flasks of schnapps were brought out and shared, and groups began to sing traditional Icelandic songs. 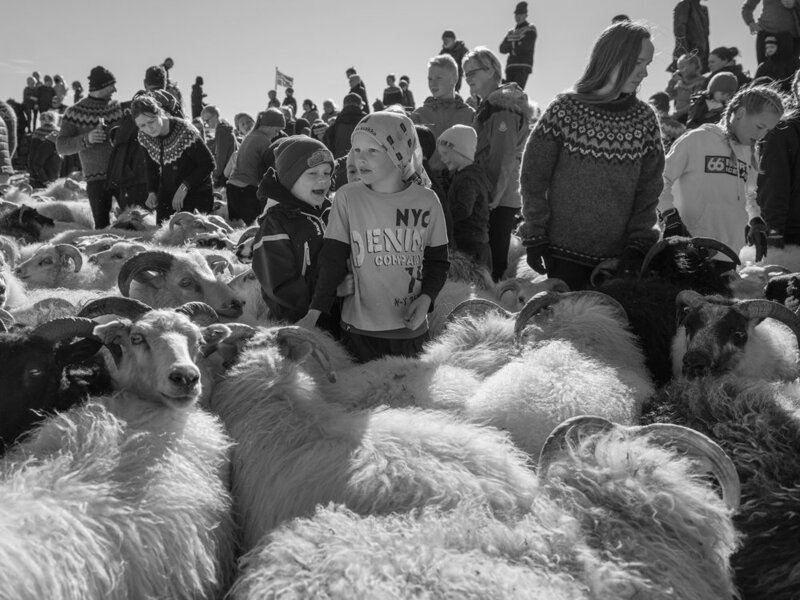 Later in the day the farmers moved their sheep to the farms and hangikjöt (a party or fun afternoon), began with all the farmers families and friends joining in the fun. Approximately a week later a team of farmers returns to the highlands to round up any sheep that were missed or escaped. These are brought home to be part of a second réttir. 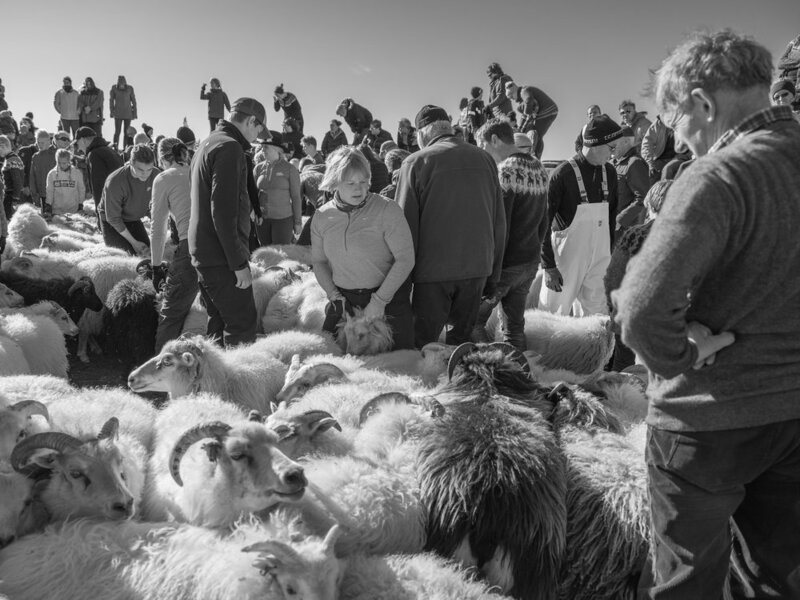 By law all the farmers must participate in gathering day, called smaladagur, where they must find all the sheep on their farms that do not belong to them. These sheep, and those from the second highland round up are brought together for skilaréttir, or mini réttir. After all of this the farmers determine which sheep will be slaughtered while the others will be sheared for their wool. The shearing takes place in the Fall since the sheep will over winter indoors, sheltered in barns. 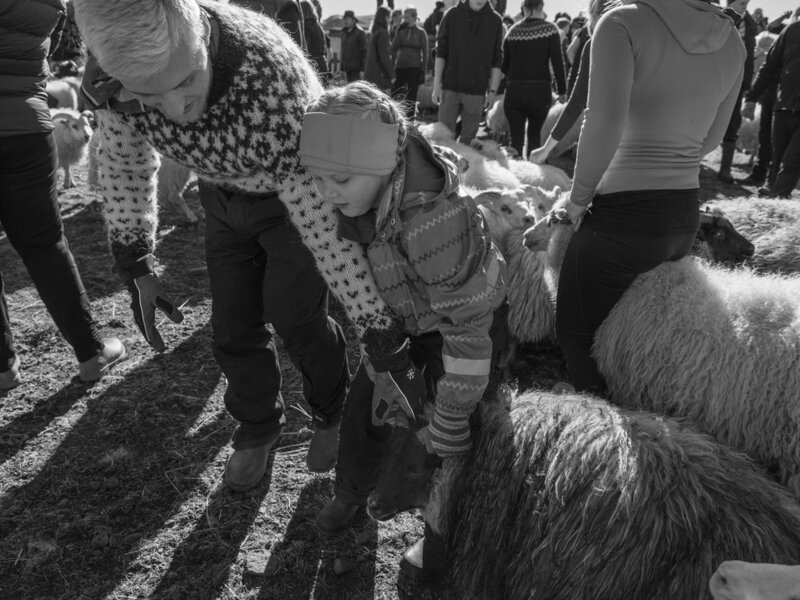 This event is remarkable and I loved every minute of it from the people, the sheep, and the horses I met, to gathering an understanding of its history and cultural importance to Iceland. And I can’t wait to go back and see it again.